Following the recent onslaught of home security systems from Nest, SmartThings, and Ring, Wink is throwing its name into the game and announcing Wink Lookout. The Lookout kit will cost $199, which is more in line with Ring's pricing, but it doesn't ask for any monthly subscription fees. That's both a plus and a minus. But before we get ahead of ourselves, let's look at the kit. It comes with the Wink Hub 2 ($99), two open/close door and window sensors ($29 each), one motion sensor with adjustable sensitivity ($39), and one siren and chime with a built-in ring of LED lights and 10 selectable sounds ($39). All of these communicate over Z-Wave, so you can purchase them individually if you already have a Wink Hub/Hub 2 or add more sensors to the kit if you have more entry points in your house. The total value is $235 if purchased separately, so you're getting a little deal by grabbing the full Lookout kit. Also, the sensors will come pre-paired with the hub so it's a little less hassle for you. In addition to the kit, a new Lookout service will roll out to all Wink users for free with the v6.5 app update and will provide a simple dashboard for monitoring your home, checking alerts, controlling the siren, along with options to call 911 or a contact should the need arise. Those of you with a smart home hub have probably already set up a system with a few window/door and motion sensors to keep an eye on the house, so the new dashboard should also be handy for you. Unlike Nest, SmartThings, and Ring, which are offering a professional monitoring service, there's nothing special about Wink's solution. And that makes it cheaper, more DIY, but also maybe less attractive for those who are used to a high security system with professional help. Wink Lookout will go on sale October 31st on Wink.com, HomeDepot.com, and Amazon.com, and probably the most interesting part is that this is the regular Wink Hub 2 we're talking about, so you can expand it with all kinds of other smart home products like lights, switches, thermostats, cameras, and more. 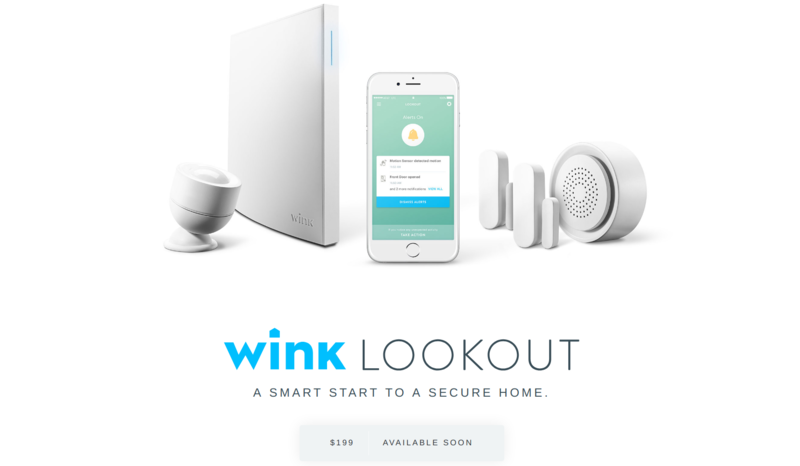 The Wink Lookout mobile service is the heart of Wink’s expanded home safety ecosystem. Free-to-use and available as part of the 6.5 release of the Wink mobile app, the platform serves as a centralized dashboard that helps you stay in touch with your home wherever you are by providing instant alerts when activity is detected, at-a-glance descriptions about which product was tripped, and recent and historical activity. When Wink detects activity in your home, you’ll immediately receive a mobile notification that prompts you to quickly take action if you suspect abnormal activity. Options include turning on the Wink Siren, pulling up your contacts list so you can notify a family member or neighbor, or call the authorities to report an incident. Wink is the smart home platform that brings all your favorite products together – so you can easily monitor, control, and automate them wherever you are. With dozens of brand partners, hundreds of compatible products, and over 2.7 million devices connected to the platform and counting, Wink makes the smart home accessible to everyone. Founded in 2014, Wink is based in New York and owned by i.am+. For more information, visit www.wink.com.